The Chinese make serious apologies to others by pouring them tea. This act is taken as a sign of regret and submission. In the traditional Chinese marriage ceremony, both the bride and groom kneel in front of their parents and serve them tea as an expression of gratitude. The customary phrase spoken to the parents during this ritual can be translated as "Thank you for bringing us up. Now we are getting married. We owe it all to you." The parents will usually drink a small portion of the tea and then give the couple a red envelope, which symbolizes good luck. This custom originated in the Qing Dynasty, about 300- 400 years ago. At that time, Emperor Qianlong would sometimes travel incognito through the empire. Servants were told not to reveal their master's identity. One day in a restaurant, the emperor, after pouring himself a cup of tea, filled a servant's cup as well. To that servant it was a huge honor to have the emperor pour him a cup of tea. Out of reflex he wanted to kneel and express his thanks. He could not kneel and kowtow to the emperor since that would reveal the emperor's identity so he bent his fingers on the table to express his gratitude and respect to the emperor. This "thanks" knock is still in used today in China and Chinese-influenced areas. The tea-drinking habits of Hong Kong residents derive from Chinese tea culture. After more than 150 years of British rule, however, they have changed somewhat to become unique in the world. This uniqueness is not only in terms of the tea itself, but also in terms of the underlying social and cultural values. The first tea house in Hong Kong was established at the end of the 19th century. At that time people bought tea leaves from tea houses so that they could serve tea to visiting guests. Tea would be brewed at the beginning of the day and would be served as guests arrived during the day. At night, the remaining tea would be poured away. They did this whether or not visitors actually arrived. This gave rise to the idiom "Tea is for pouring away." In contemporary society, Hong Kong people buy tea at tea houses not only for serving their guests, but also for themselves. Some while ago, when buying tea leaves at tea houses, the staff would take the tea leaves out of a large, foil container, weigh it and then pack it with papers and a plastic bag. This kind of packaging wasn't considered very attractive and it would negatively affect the quality of the tea leaves as they would oxidize quickly, thereby losing their aroma. The packaging of tea leaves has greatly improved since then. Now tea leaves are vacuum-packed in high density plastic packs with fancy packaging. Not only is the quality raised, but the market value of the tea is also increased. Fast and convenient without losing the original taste, the tea pocket is changing the domestic habit of tea drinking in Hong Kong. "Tea pockets", also known as tea bags, have in recent years been used in Chinese tea. Initially they could be found in the supermarket, but were not popular as they were not well publicized and not very attractively packaged. As earlier with tea leaves, there has been an increase of well-packaged tea bags with any number of varieties of tea leave contained within. Most modern packages can be resealed so as to keep the tea dry. One of the brands has even made an inspiring design of the tea pocket that it gives the tea pocket a tetrahedral (pyramid-like) shape which allows more volume for larger sized tea leaves to expand and impart their flavor. Hong Kong is a place with plenty of night life. In contrast, streets are almost empty from seven to eight in the morning. Most shops open at or after nine o'clock in the morning, where Cantonese restaurants open at about six or even earlier (restaurants in the Western District open at about 4:00am). The working class of Hong Kong usually have breakfast in these Cantonese restaurants in the early morning. They enjoy 盅兩件 (Lit. One bowl with two pieces, meaning a cup of tea with two Dim Sums) and they read newspapers in the morning before they go to work. Many elderly people bring their caged birds to the restaurants and chat with others. They can spend a whole morning doing this. Yuanyang (Chinese: 鴛鴦), or Yuenyeung, is a popular kind of beverage in Hong Kong, which is a mixture of Hong Kong-style milk tea and coffee. It was originally served at dai pai dongs and cha chaan tengs, but is now available at many restaurants. It can be served hot or cold. Yuanyang, which means "Mandarin Duck" in Chinese, is a symbol of conjugal love in Chinese culture, as the water bird usually appears in pairs. Obviously, the connotation of "pair" is used to name the drink, which is the pairing up of coffee and milk tea. In the past, people often enjoyed tea in old restaurants with a long history, also known as "neighboring restaurants" (茶寮). This kind of restaurant was built with simple and cheap decoration. However, it was the place for the neighbors to meet as a morning routine. Especially for the elderly, their main entertainment was going to chat with their neighbors in the "old place". They read newspapers, discuss current issues, their family life, their good old days...to name but a few. As time passed by, a strong bond would form between the patrons and the restaurants. From now, we can still find this kind of restaurants in some old estates in Hong Kong. But if you want to experience this unique feature of Hong Kong, don't stay up late! Most of the restaurants in old estates close before the noon. Those popular and favorite dim sum would probably be sold-out before noon as well. These traditional restaurants have phased out. This is because the elderly population has decreased in number, and the young generations hold a view that the old restaurants are un-hygienic and noisy. They prefer to go to the big and new restaurants in the large plazas, despite the fact that the prices are more expensive. The Flagstaff House Museum of Tea Ware is a branch museum of Hong Kong Museum of Art, located centrally in Hong Kong Park. It is a place for collecting, studying and displaying tea ware and holding regular presentation or demonstration lectures to promote Chinese tea drinking culture. Many famous Yixing teapots are exhibited in the museum. Tea drinking in Taiwan is akin to the high art of wine tasting in the west. Tea drinkers will gladly pay a few thousand NT dollars for a half kilogram of good tea leaves. Mountainside tea-art shops and restaurants offering open-air tea drinking, dining, and picturesque views have become favorite destinations for city-dwellers. The typical Chinese family in Taiwan owns a least one set of tea ware. Many people collect tea pots as a hobby. Most of the people in Taiwan have purple porous pottery tea pots. Traditionally, "raise the tea pots" at home are way of life in Taiwan. The tea pots are used to brew teas intensively so that the surface of porous pottery tea pots becomes "bright". The process is called "raise the tea pots" which is a process to increase the value of the purple porous tea pots. Tea stores are on almost every blocks in Taipei. The Perennial Tea Ceremony (四序茶會) is a Taiwanese tea ceremony, created by Lin Easu (林易山), of the Ten Ren Teaism Foundation. The first two characters of the Chinese term literally mean four steps or sequences that are linked together, the latter two simply mean "tea ceremony". Each of the four participants represents a season of the year, and along with the "center" of the ceremony, with incense burners and flowers, these five represent the five elements and colors. Each participant is assigned a season, and these four seasons around the center- the earth- suggest an idea of the endless cycle of seasons, hence the name Perennial Tea Ceremony. The Wu-Wo Tea Ceremony is a style of tea ceremony that encourages participants to forget about knowledge, wealth, and appearance to establish a group equality without prejudice. 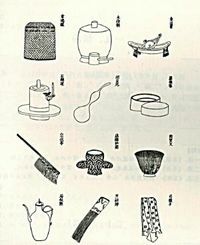 This concept of Wu-Wo is shown in the Wu-Wo Tea Ceremony. “Wu” and “Wo” are actually Chinese words with philosophical meaning. The word “wu” (無/无) means a void or absolute emptiness as far as the mind or senses can determine; it is therefore like an infinite space. The word “wo” (我) means mine, self or being. When joined, these words almost seem like a contradiction in terms: the word, “wo”, seems like being and the word, “wu”, seems like not being. The typical interpretation of “Wu-Wo” (無我/无我), however, means to empty the mind like an endless void anything to sense; it is just “being,” with no physical or mental attachments. A circular rainbow is the symbol for the Wu-Wo Tea Ceremony. A rainbow is made of seven basic colors which, when combined together, become blank white light. The Wu-Wo Tea Ceremony pursues the circular rainbow and goes towards the blank light or empty circle in the flag's center. The blended white light or empty circle of the flag’s rainbow can be thought of as “wu”. The Wu-Wo Tea Ceremony follows this concept: for example, people have knowledge, wealth, and appearance, and try to forget these things and transcend. Wu-Wo Tea Ceremony began in Taiwan. Grand Master Tsai, Rong Tsang is the director of “Lu-Yu Tea Culture Institute” and the founder of the “Wu-Wo Tea Ceremony.” He has played an active part in the growth of this once small group from Taiwan (almost twenty years ago) into a now International Organization. Now Grand Master Tsai, Rong Tsang and Steven R. Jones are writing in English to help expose people to the joys of tea and to further extend the Wu-Wo Tea Ceremony. The Gong Fu, kungfu Tea Ceremony ( 功夫茶 ) is a way of preparing tea skillfully. It differs from the Chanoyu tea ceremony practiced in Japan, which employs rigid rules, proscribed steps and usually involves meditation. In addition, the Japanese Tea Ceremony usually employs only powdered green tea (called matcha). While both the Gong Fu and Chanoyu tea ceremonies have the same goal of producing and sharing a satisfying cup of tea, the Gong Fu Tea Ceremony is more relaxed, encouraging all participants to speak freely with each other throughout. Although particular Gong Fu tea ceremonies differ by region (China, Taiwan, Singapore, Hong Kong), they all allow any kind of tea to be used as the basis of the ceremony. In the last 30 years the method of making good tea from the first brew to the last brew, and taking into account water temperature according to the variety of tea brewed has changed and become a methodology (skill brewing). In recent years in Taiwan the invention of the filtered tea pitcher has made a great improvement in tea brewing. Ideally the pot should be small and paired with a second serving pot to help evenly blend the tea flavor. The equivalent of approximately one teacup of tea is brewed at a time in this approach and the tea is consumed from very small cups. This permits very fine control of temperature vs. brewing time. When such specialty pots are not available, regular-sized pots are also usable, but they suffer from a lack of control over brewing times and temperatures, reducing the quality of the ensuing tea as a result. The water should be "just boiled" (about 98 degrees Celsius) for oolong and black teas. It should be filtered of chlorine, salt and other such treatments, but it should not be distilled nor dematerialized -- distilled/dematerialized water results in very "flat"-tasting tea. A suitable space must be provided. A table large enough to hold the tea-making utensils, the drip tray, and the water is the minimum necessary. Ideally the surroundings should be peaceful and conducive to relaxation and socialization. Incense, flowers and low, soft, traditional music will all add to the ambience, as will songbirds. Water is brought to a boil. The brewing pot is filled with boiling water. The water is then transferred in turn to the tea pitcher, the aroma cups (if used), and finally to the serving cups. This is done to bring the temperature of the utensils up to appropriate levels while washing out any dust which may have accumulated in the utensils; this water is then discarded. Tea is measured and placed into the brewing pot. The first round of brewing begins with filling the pot full of near-boiling water. The pot is filled to the brim and excess foam and tea leaves are simply swept aside by the lid before placing it firmly on top. A little extra hot water poured over the top helps keep the temperature high. The tea is brewed for approximately one minute and then quickly transferred to the serving pot to mix it evenly, avoiding uneven flavor from cup to cup. A narrow, metal filter can be used to catch fine particles that would spoil the flavor of the tea. Jones, Steven R. (2005). Perennial Tea Ceremony.